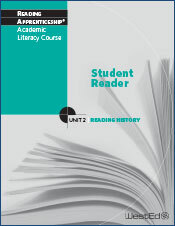 The Student Reader accompanying Unit 2: Reading History of the Reading Apprenticeship Academic Literacy Course introduces students to a range of history texts focused on the topic of “rights,” and especially the women’s suffrage movement in the United States. Texts include documents from the Library of Congress and the United Nations, press releases about civil liberties court cases, excerpts from a suffragette’s first-person narrative, 19th and early 20th century journalism and essays, a textbook excerpt, and the 30-page booklet Women’s Suffrage: Giving the Right to Vote to All Americans. 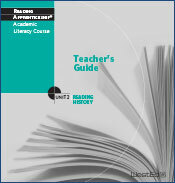 This second unit of the Reading Apprenticeship Academic Literacy Course introduces close reading of a range of history texts and genres. Readings focus on the topic of "rights," and especially the women's suffrage movement in the United States. Students continue to practice literacy skills introduced in Unit 1 and add new strategies related to the reading of history texts specifically.